Very slightly soluble in water, soluble in ethanol (96 per cent) and in methanol, sparingly soluble in acetone, slightly soluble in methylene chloride. It shows polymorphism (5.9). Prednisolone is a synthetic adrenocortical steroid drug with predominantly glucocorticoid properties[1, 2, 4, 10]. Prednisone is a white to practically white, odorless, crystalline powder and has a molecular weight of 358.43. Prednisone is very slightly soluble in water, slightly soluble in alcohol, chloroform, dioxane, and methanol. Some of these properties reproduce the physiological actions of endogenous glucocorticosteroids, but others do not necessarily reflect any of the adrenal hormones' normal functions; they are seen only after administration of large therapeutic doses of the drug. The pharmacological effects of prednisolone which are due to its glucocorticoid properties include: promotion of gluconeogenesis; increased deposition of glycogen in the liver; inhibition of the utilization of glucose; anti-insulin activity; increased catabolism of protein; increased lipolysis; stimulation of fat synthesis and storage; increased glomerular filtration rate and resulting increase in urinary excretion of urate (creatinine excretion)[5-9]. It is indicated for the treatment of primary or secondary adrenocortical insufficiency, such as congenital adrenal hyperplasia, thyroiditis. It is also used to treat psoriatic arthritis, rheumatoid arthritis, ankylosing spondylitis, bursitis, acute gouty arthritis and epicondylitis; indicated for treatment of systemic lupus erythematosus, pemphigus and acute rhematic carditis; can be used in the treatment of leukemias, lymphomas, thrombocytopenia purpura and autoimmune hemolytic anemia; can be used to treat celiac disease, insulin resistance, ulcerative colitis and liver disorders. Glucocorticoids such as Prednisolone can inhibit leukocyte infiltration at the site of inflammation, interfere with mediators of inflammatory response, and suppress humoral immune responses[10-13]. The antiinflammatory actions of glucocorticoids are thought to involve phospholipase A2 inhibitory proteins, lipocortins, which control the biosynthesis of potent mediators of inflammation such as prostaglandins and leukotrienes[10-13]. Prednisolone reduces inflammatory reaction by limiting the capillary dilatation and permeability of the vascular structures. These compounds restrict the accumulation of polymorphonuclear leukocytes and macrophages and reduce the release of vasoactive kinins. Recent research suggests that corticosteroids may inhibit the release of arachidonic acid from phospholipids, thereby reducing the formation of prostaglandins. Prednisolone is a glucocorticoid receptor agonist . On binding, the cortico-receptor-ligand complex translocates itself into the cell nucleus, where it binds to many glucocorticoid response elements (GRE) in the promoter region of the target genes. The DNA bound receptor then interacts with basic transcription factors, causing an increase or decrease in expression of specific target genes, including suppression of IL2 (interleukin 2) expression. Prednisolone is cleared from the body primarily by hepatic metabolism, and greater than 90% of radioactivity administered orally or intravenously as[4-14] prednisolone is recovered in the urine[16,17]. Only approximately 7-15% of an oral dose of prednisone or prednisolone is excreted as unchanged prednisolone in the urine, the remainder being recovered as a variety of metabolites[18, 19]. The plasma half-life of prednisolone ranges from 2.5 to 3.5 hr(1). Similar half-life values for prednisolone are observed after oral prednisolone is administered[20, 21]. Mean plasma half-lives were 4.0 hr and 5.0 hr for the 12and 48-mg doses, respectively. Plasma clearance averaged 98.5-ml/min/1.73 m 2 and 120.1-ml/min/1.73 m 2 after these doses. Neither half-life nor clearance was statistically different between the two dose levels. Values for volume of distribution were calculated to be 21.6 and 27.7 liters /1.73 m 2 for Vl and 12.1 and 31.1 liters/1.73 m 2 for V2 with the 12and 48-mg doses, respectively. Only the differences in V2 were found to be statistically significant. It appears that prednisolone may exhibit dose-dependent pharmacokinetics, so that, with increasing dose, values for volume of distribution, plasma clearance, and half-life may increase. Although the exact reasons for these changes have not been established, they are believed to be related to changes in the plasma protein binding of prednisolone. It has been shown that prednisolone binds to plasma proteins (transcortin and albumin) in a nonlinear manner over the range of doses used, so that the percentage unbound increases with increasing dose. This then leads to the observed changes in the pharmacokinetic parameters of prednisolone. Various adverse reactions may be associated with the use of prednisolone[1, 10]. Gastrointestinal: Abdominal distention, elevation in serum liver enzymes levels (usually reversible upon discontinuation), hepatomegaly, hiccups, malaise, nausea, pancreatitis, peptic ulcer with possible perforation and hemorrhage, ulcerative esophagitis. Neurological: Arachnoiditis, convulsions, depression, emotional instability, euphoria, headache, increased intracranial pressure with papilledema (pseudo-tumor cerebri) usually following discontinuation of treatment, insomnia, meningitis, mood swings, neuritis, neuropathy, paraparesis/paraplegia, paresthesia, personality changes, sensory disturbances, vertigo. Corticosteroids can produce reversible hypothalamic-pituitary adrenal (HPA) axis suppression with the potential for corticosteroid insufficiency after withdrawal of treatment. Drug-induced secondary adrenocortical insufficiency may be minimized by gradual reduction of dosage. This type of relative insufficiency may persist for months after discontinuation of therapy; therefore, in any situation of stress occurring during that period, hormone therapy should be reinstituted. If the patient is receiving corticosteroids already, dosage may have to be increased. Corticosteroids may increase the risks related to infections with any pathogen, including viral, bacterial, fungal, protozoan, or helminthic infections. The degree to which the dose, route and duration of corticosteroid administration correlates with the specific risks of infection is not well characterized, however, with increasing doses of corticosteroids, the rate of occurrence of infectious complications increases. Corticosteroids may mask some signs of infection and may reduce resistance to new infections. The effects of accidental ingestion of large quantities of prednisone over a very short period of time have not been reported, but prolonged use of the drug can produce mental symptoms, moon face, abnormal fat deposits, fluid retention, excessive appetite, weight gain, hypertrichosis, acne, striae, ecchymosis, increased sweating, pigmentation, dry scaly skin, thinning scalp hair, increased blood pressure, tachycardia, thrombophlebitis, decreased resistance to infection, negative nitrogen balance with delayed bone and wound healing, headache, weakness, menstrual disorders, accentuated menopausal symptoms, neuropathy, fractures, osteoporosis, peptic ulcer, decreased glucose tolerance, hypokalemia, and adrenal insufficiency. Hepatomegaly and abdominal distention have been observed in children. Treatment of acute overdosage is by immediate gastric lavage or emesis followed by supportive and symptomatic therapy. For chronic overdosage in the face of severe disease requiring continuous steroid therapy the dosage of prednisone may be reduced only temporarily, or alternate day treatment may be introduced. You should not use prednisolone if you are allergic to it or have a fungal infection anywhere in your body. Prednisolone has the potential weaken your immune system, making it easier for you to get an infection. Steroids can also worsen an infection you already have, or reactivate an infection you recently had. You should keep consulting your doctors about any illness or infection you have had within the past several weeks. To make sure prednisolone is safe for you, let your doctor know if you have ever had active tuberculosis, a thyroid disorder, herpes infection of the eyes, stomach ulcers, ulcerative colitis, or diverticulitis, depression, mental illness, or psychosis, liver disease (especially cirrhosis), high blood pressure, osteoporosis, a muscle disorder such as myasthenia gravis; or multiple sclerosis. You should also inform your doctor if you have diabetes. Steroid medicines may further increase the glucose (sugar) levels in your blood or urine, worsening the situation of diabetes. You may also need to adjust the dose of your diabetes medications in that case. It is not known whether this medicine will harm an unborn baby. Tell your doctor if you are pregnant or plan to become pregnant. It is not known whether prednisolone passes into breast milk or if it could affect the nursing baby. Tell your doctor if you are breast-feeding. Czock D, Keller F, Rasche FM, Häussler U (2005). "Pharmacokinetics and pharmacodynamics of systemically administered glucocorticoids". Clinical Pharmacokinetics. 44 (1): 61–98. Sandström, B. "Some observations on the influence of insulin, prednisolone and free amino acids on the glucose metabolism in cultivated liver tissue." Acta Soc Med Ups 71.1(1966): 41-48. Gravholt, C. H., et al. "Preferential stimulation of abdominal subcutaneous lipolysis after prednisolone exposure in humans. " Obesity Research 10.8(2012): 774-781. Puustinen, T., Punnonen, K., & Jansén, C. T. (1985). Effect of prednisolone on the fatty acid composition and the formation of arachidonate metabolites in human keratinocytes in culture. Prostaglandins Leukotrienes & Medicine, 18(3), 293-299. Stichtenoth, D. O., Fauler, J., Zeidler, H., & Frölich, J. C. (1995). Urinary nitrate excretion is increased in patients with rheumatoid arthritis and reduced by prednisolone. Annals of the Rheumatic Diseases, 54(10), 820-824. Ost, L., Tydén, G., & Fehrman, I. (1988). Impaired glucose tolerance in cyclosporine-prednisolone-treated renal graft recipients. Transplantation, 46(3), 370-2. Gristwood, R. W., Llupiá, J., Fernández, A. G., & Berga, P. (1991). Effects of theophylline compared with prednisolone on late phase airway leukocyte infiltration in guinea pigs. International Archives of Allergy & Applied Immunology, 94(1-4), 293-294. Akindele, A., Adeneye, A., Olatoye, F., & Benebo, A. (2014). Protective effect of selected calcium channel blockers and prednisolone, a phospholipase-a2 inhibitor, against gentamicin and carbon tetrachloride-induced nephrotoxicity. Human & Experimental Toxicology, 33(8), 831-846. B VernonRoberts, J D Jessop, & J Doré. (1973). Effects of gold salts and prednisolone on inflammatory cells. ii. suppression of inflammation and phagocytosis in the rat. Annals of the Rheumatic Diseases, 32(4), 301-307. Lee SH (November 2015). "Mechanisms of Glucocorticoid Action in Chronic Rhinosinusitis". Allergy, Asthma & Immunology Research. 7 (6): 534–7. Kadmiel, M., & Cidlowski, J. A. (2013). Glucocorticoid receptor signaling in health and disease. Trends in Pharmacological Sciences, 34(9), 518-530. A. A. Sandberg and W. R. Slaunwhite. Differences in metabolism of prednisolone-C 14 and cortisol-C TM. J. Clin. Endocrinol. 17:1040-1050 (1957). A. Vermeulen. The metabolism of 4-14C prednisolone. J. Endocrinol. 18:278-291 (1959). T. Uete and N. Shimano. A simple method for separate determination of delta 4and delta~'4-corticosteroids in urine. Clin. Chem. 17:161-165 (1971). J. English, J. Chakraborty, V. Marks, D. J. Trigger, and A. G. Thomson. Prednisolone levels in the plasma and urine: A study of two preparations in man. Br. J. Clin. PharmacoL 2:327-332 (1975). R. Leclercq and G. Copinschi. Patterns of plasma levels of prednisolone after oral administration in man. J. Pharmacokin. Biopharm. 2:175-187 (1974). P. J. Morrison, I. D. Bradbrook, and H. J. Rogers. Plasma prednisolone levels from enteric and non-enteric coated tablets estimated by an original technique. Br. J. Clin. Pharmacol. 4:597-603 (1977). G. P. Lewis, W. J. Jusko, C. W. Burke, and L. Graves. Prednisone side-effects and serum-protein levels. Lancet 2:778-781 (1971). ChEBI: A glucocorticoid that is prednisone in which the oxo group at position 11 has been reduced to the corresponding beta-hydroxy group. 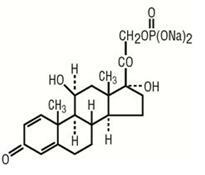 It is a drug metabolite of prednisone. Cortalone(Halsey); Delta-Cortef (Pharmacia & Upjohn); Fernisolone(Ferndale); Meti-Derm (Schering); Prelone (Muro); Prelone(Teva); Sterane (Pfizer). Causes sodium retention; may have side effects similar to cortisone. A poison by intravenous and subcutaneous routes. Moderately toxic by ingestion and intraperitoneal routes. Human teratogenic effects by an unspecified route: developmental abnormalities of the central nervous system; effects on embryo or fetus: fetal death, extra embryonic structures. Human reproductive effects by an unspecified route: stdlbirth. An experimental teratogen. Experimental reproductive effects. Human mutation data reported. When heated to decomposition it emits acrid smoke and irritating fumes. 50-24-8 US $10.00 / KG 10G 99%min 100kg/week Hubei XinRunde Chemical Co., Ltd.